This month’s Sunday 6 August classic film is the 1964 cold war drama ‘Fail Safe’. Never heard of it? Neither had I until I did some digging and unearthed a lost treasure. This film is a 1964 cold war thriller based on the 1962 novel of the same name by Eugene Burdick and Harvey Wheeler. 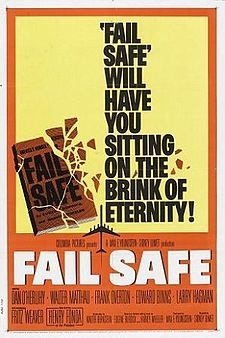 Directed by Sidney Lumet who gave us ‘Dog day Afternoon’ and ‘Serpico’, Fail Safe is one of Lumet’s early works and is noted for vigorous storytelling and social realism. It portrays a fictional account of a nuclear crisis. The film features performances by actors Henry Fonda, Walter Matthau and a very fresh faced Larry Hagman (aka JR Ewing from Dallas TV series) in an early film role. Fail Safe describes how Cold War tensions between the Soviet Union and the United States lead to an accidental thermonuclear first strike after an error sends a group of US bombers to bomb Moscow. This is scary stuff and parallels what is happening currently in the world. (Courtesy Wikipedia). You know the drill by heart now. Bring along anything/anyone that loves film making at its finest to watch a lost classic. Sunday 6th August upstairs at the Franklin Palais. Doors open 6.30pm, film starts when someone flicks the lights. After 7.15pm but before 7.30pm. Yes, simple but it still works a treat. Admission is $5. A small price to pay to watch a cinematic masterpiece. Bar will be running with reasonably priced quality refreshments to assist with digesting this high quality offering, the usual red/white/beer/cider/tea/coffee/milky milo. Please bring a plate ( with something on it ) to share for supper during the intermission. Hope you can make it. Deb & the "Classic Movie Team".